When this section of the kitchen was torn out to make room for a freestanding oven, I decided to not put the corbels back under the hood. They seemed too ornate and and I had a more streamlined look in mind. Still, I kept my options open should I decide the corbels should go back. Also, there was a question as to what color they should be after the cabinets were painted green. Should they also be green? That would look silly. I thought they would look great if they were natural wood, like washed pine. I gave them to Ian the Master Painter and this is what I got. He faux finished them to look like a fine piece of furniture, taking his cue from my dining room hutch. Although he did a great job, it wasn't the look I had in mind. I wanted the corbels to look like I found them in a salvage yard! I sent them back to be stripped and then finished them myself by rubbing a golden oak stain over them and letting them sit outside for a month. Ryan the Contractor came over last week to install them. We made the decision to not finish them with moulding around the top, just leave them bare and raw. 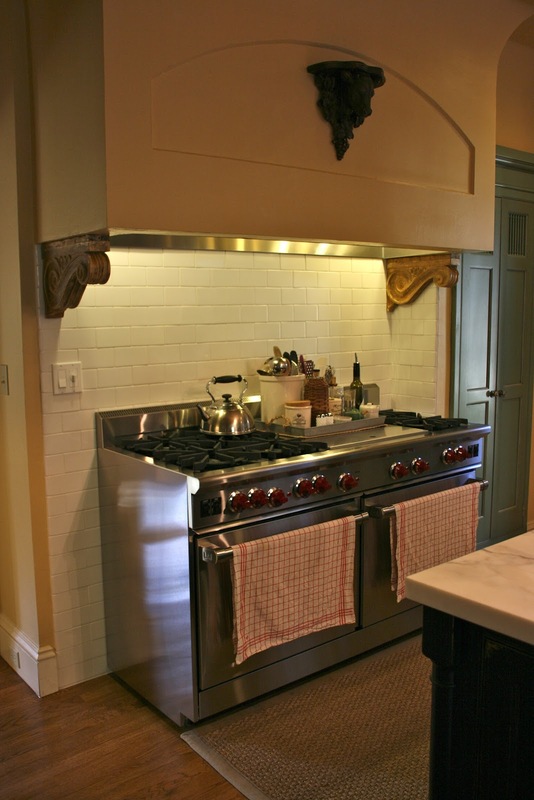 Before the corbels were added, the stove seemed like it was a little lost on this wall. Now the corbels box it in and frame it, giving the stove importance. The light finish echoes the bamboo shade and eventually the raw oak curtain rod that will be installed when I get around to repurposing my dining room drapes for the window. I'm really glad I decided to keep the corbels. Yes, they are a little ornate, but the rustic finish counters that aspect. Also, they are copies of the original corbels on the front of the house, circa 1906. It's only right that they found their way back where they started! Your home is so beautiful. Love the corbels. I love the bare old world look of them after you took them over. Your kitchen is so beautiful! Delores, the corbels look great! I just love your kitchen! I think they are perfect for that area and love the color since you left them outside. Wonderful idea! a girl can never have too many corbels...these are amazing and I'm looking for some to make a shelf. I have looked all over ebay and am bidding on some now...but I want a little bit older. I might need to buy new and distress as you did..thanks for the idea! I love that particular finish very much and it is just wonderful in your kitchen, which is gorgeous. I am seriously in love with your countertops. What a beautiful room to cook and gather in. Gorgeous! Leaving them outside to weather a little was a brilliant idea. I'm so glad you put them back up. They are too pretty not to be there. Delores, the weathered look is just right. Your kitchen is gorgeous. My chef would love to have a kitchen like this with all that counter space and that super fine stove. I love everything about that kitchen! Gorgeous kitchen. The corbels look great and I totally agree that they are right at home. Gorgeous, gorgeous, gorgeous! I love them and I think they look perfect! I also love the front of your house and the entire kitchen for that matter! So glad you shared these pictures with us! Hope you are doing well! I love how the corbels look now, they have importance and age without feeling too formal...the room is wonderful! Hi Delores! Oh, your corbels look marvelous all stained and weathered. Now I drool every time I see your most gorgeous kitchen! It's so beautiful! First the new stove range looks great. Second I like what you did with the corbels. They really pop out at you now. The faux paint job was beautiful, but I agree the raw natural look fits your new kitchen much better. Perfect! Seriously, I've got to hire Ian to paint my kitchen when we're ready cuz the guy is fantastic. I do love how the corbels looked after you weathered them, what a great idea! Love how your kitchen is taking such a dramatic change. Gorgeous. I just love your kitchen. Everything looks so nice. Hope I can do a good job next year when we do ours. Great job! I like the corbels and your kitchen looks wonderful. My range is similar and I have the white marble island as well! Absolutely beautiful! You chose the perfect finish for the corbels ... what a stunning space. Thank you for sharing! Love the weathered corbels! its the perfect detail. Beautiful! I enjoy your blog. Would you be so kind as to post a picture of the outside of your awesome home? Thank you. Those corbels look great. I would have never thought of leaving them outside. the raw look of architectural salvage is just what they needed. perfect!! Also completely love that new lantern in the entry! The corbels are awesome...and so is your huge stove! It is fantastic!!!! You have wonderful taste...and a lovely home!